Dota 6.60 Bug - Dota-Allstars 6.60 Exploit. Some people reported that the brand new Dota-Allstars 6.60 contains some bug/exploits. This is already expected since Dota 6.60 contains many changes. If you found any Dota 6.60 bug/exploit, share it here. And of course, report it to IceFrog so we can get the fixed map, either on Dota 6.60b or Dota 6.61. Use a hero that can switch their forms of attack(range/melee) like Syllabear/Troll/Terror Blade and you can have 2 quelling blades on your inventory. Quelling Blade gives +36% bonus damage to non-hero units for melee and 12% for ranged heroes. And you get both bonus 136%*112% = 152% damage on creeps. How? Buy a Quelling Blade on melee mode. You will got the normal Quelling Blade. Buy another Quelling Blade, you will got Range Quelling Blade. Don't worry, the above bug already reported to IceFrog. Another bug is with Batrider when he use Firefly. Some skills cannot target him while he is flying. This include Laser, Frost Bite and others skills based on Root. Apparently those skills cannot cast on flying unit. 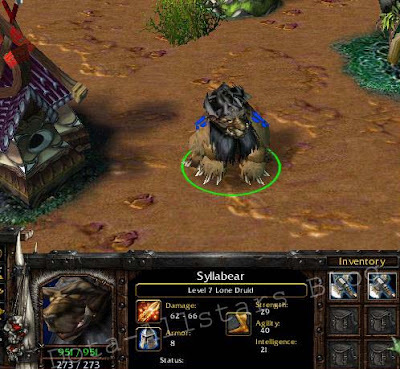 Update: The above bugs already fixed on Dota 6.60b, check it out! medusa's ulti not working properly. sometimes simply does nothing, even if medusa is facing the target wich is 300 units away. Huge bug I would say is the match I just played. A few moves with enchantress and boom, lost control. No right-clicking but my mouse still worked. Couldn't use F1 to redirect to my hero either, but chat worked. So my hardware is good, patched, software good, never happened on older versions either. no bugs present until proven. please post first an evidence like a video or a replay. CungPowCow, that's just a random bug that i've encountered before. Only things that work are the F10 etc menu and chat. Requires a restart i guess. I'd say razor's new passive is a bit faulty and doesnt really do what its meant to. Where is a bug with '-tip' mod!!! Than any of player types this mod the game kiks out some of players (or maybe all players)!!!!!!!! And guys can you say how are working Tauren's and Razor's 3-rd spell!!! New eyes in the forest doesn't work with "terrain snow", the tree created is still green. Just played a -CD game where it would not let the host or me(pink) select the heros after draft was done. dunno if it was a fluke or what, but we couldnt click the checkmark to become the hero. Force staff on Pudge/Venge allows stucking on cliffs, should that be fixed? So when you go to range mode to get your 2nd quelling blade, what happens if you go back into melee mode? what happens then? Is it safe for the glitch to still work by switching forms back and forth after you get your quelling blades? "Force staff on Pudge/Venge allows stucking on cliffs, should that be fixed?" Yes it should be i think, since those heroes aren't allowed to purchase blink dagger for that reason. "Maiden can't frostbite the Batrider"
That's not a bug although it is very annoying. Frostbite can't hit flying units. This are coming also for Earthshaker's skills which is mostly land target. You can cast fissure but it won't damage flying bat rider. After troll warlord uses his ultimate, one of his teammate pops double damage rune from bottle or just pick up double damage rune, then the whole team receives double damage buff. BKB is not working on the skills of the new heroes i think....cause when i use BKB, tauren's SS still damages me and batrider's SS can still be cast upon me, so my bkb was pretty useless. Is there anyone who experience this too? biGesst bug ever not seen in any dota map if u make CUIRLASS u give -5 armor to towers..and BD SYSTEM dosent work noobz can still do bd??? it already said that the armor aura of cuirass works positively on allied towers and negatively on opponent towers. Do you ever think off the way to disable a hero for the whole game which lots of people are familiar with in 5.84 can be use back? Since the Force Staff can be use by any hero and the effect can cast on anyone in the game, it can actually push himself into the higher place beside the river. It means that the particular hero could be useless if he bring none of the item that can chop down the trees. zzz have u ever to use this item?? the knockback will destroy the tree but will never knock u out of the terrain. "BKB is not working on the skills of the new heroes i think....cause when i use BKB, tauren's SS still damages me and batrider's SS can still be cast upon me, so my bkb was pretty useless. Is there anyone who experience this too?" "the knockback will destroy the tree but will never knock u out of the terrain." "Do you ever think off the way to disable a hero for the whole game "
same as the above post I can't control batrider for some reason. Actually this happen a few days ago when I've tried to test the map in Single game I'm testing Batrider after using some of BR skill I can't control him anymore. There is -unstuck command if you didn't know. When you use it, you'll be teleported to fountain for free but its channeling and takes 60 seconds. IceFrog stated that he is not responsible for old patch bugs. You must have 1.23 to have bug free map. "nerf bat its not fair cause hes flying he can pass through slopes if ice wants to retain it the made all flying heroes do that"
100% crap! First, its an ability damnit! So what if he can fly over things? Its powerful but its the first version the guy is in, he'll get nerfed sooner or later. Secondly, if all flying heroes could fly over stuff, what would that make Viper? An unkillable hero that can see everything around him and chase like a crazy serial murderer? Third, there are many skills that can kill him when he's flying. Why don't you say that blink can pass through anything? Give Icefrog a break, even he is not perfect! Bugs are there, imbalances are there, he tries to fix them, that's good enough for me. i think its Vipers but.. the nethertoxin. it needs to attack units to make its toxins more powerful but i use S "stop". every stop of my attack my attacks improves. Bugs found: One of my friend played leviathan and when trying to farm creeps (level 1 sent camp) he suddenly froze. Lost control of hero , hero coulndt move or cast spells or use inventory. Unstuck fixed the problem then! Bug-exploit. troll with Qeuling blade and poorman shield can benefit of the meelee reductions/damage while beeing range! Sometimes i coundt use treant ulti on batrider. i guess that was mentioned above so i hope icefrog reworks or only ground spells to affect air as well OR remove this skill! I was playing with axe once...grinding and stuff like that to get my levels like usual. Well i was beaten down by creeps and harrasing heros to about 300 or less HP. Well i began to back out and go home cause gank was coming. My character was simply unresponsive to my commands as if computer ai took over him. I was clicking away but he ran right into creeps and heros. (LAME) I was pissed off because i was then being harassed by teamates the usual "noob" calling. None of my equipment is faulty. ^obviously, someone was controlling your character. People usually do that when you SHARE your hero.